Community Service – The goal is to engage and involve employees in the mission of corporate citizenship. In 2010 Siemens employees in the United States volunteered more than 41,000 hours. Disaster Relief – Caring Hands Disaster Relief involves employee fund raising in response to local, national or global disasters that impact our employees, operations or business partners. Following the earthquake in Haiti Siemens donations include water purification systems, portable ultrasound medical systems, critical care blood gas and blood electrolyte analysis, DOT-IT flashlights (with batteries) and more. Community Excellence Awards – These awards recognize teams of employee volunteers who undertake outstanding and innovative community service projects. In recognition of each team’s efforts, the Award includes a cash grant donation for the non-profit organization of involvement. The Drive Technologies Division of Siemens found a great way to celebrate the holiday season! 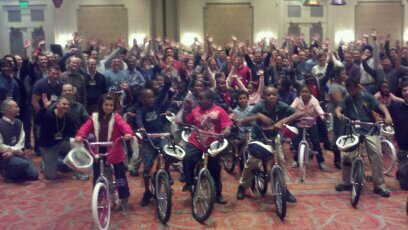 And the Build-a-Bike team building is an excellent example of Siemens Caring Hands.